The “Scuole” in Venice were associations of laymen who bound themselves to certain religious duties and to the assistance of their fellows in sickness and misfortune. This lay confraternities are of considerable interest as their past wealth enabled them to play an important role in the patronage of Venetian artists. Of all the “Scuole” existing in Venice at the time of the Republic, only few were able to preserve unaltered their original decoration, as many were in fact dismantled by Napoleon. The Scuola dedicated to Saint Roch contains the richest and most important collection of Tintoretto's paintings, made by the artist over a 23-year period and without assistants: a visionary cycle of holy paintings from the depths of the imagination and a truly illustrated Bible. Next to San Rocco is the amazing Franciscan Church of the Frari, with its dignified air of Apostolic austerity. The church contains sculptures of all styles, works of Giovanni Bellini and Paolo Veneziano. 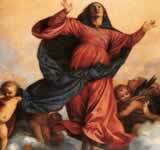 as well as the most celebrated of all Titian paintings, “The Assumption of the Virgin Mary”.